Folks from around the Red Neck Riviera between Orange Beach, Alabama and Pensacola, Florida treasure the Martin. 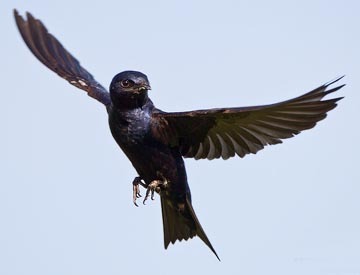 The fast-flying, bug-eating, acrobatic birds spend six crop-growing months each year sating voracious appetites for bugs to the joy of humans who think the Martin should be the National Bird. Florida and Alabama farmers will attest to my veracity. Many early dove season hunts found me busting caps on a half case of shotgun shells while bagging a dozen dove. Rest assured though, the old trigger finger never tightened when a Martin crossed the sights. The Martins were more plentiful over the fields than dove, but any hunter who accidentally fired at a Martin, let alone hit it, would surely be run off while dodging lead himself. Ocean Breeze East Condominium is a couple of miles east of the FloraBama Lounge on Perdido Key. From my recliner on the balcony of our top floor unit, the sugar sand beach was eye-hurting bright in the morning sun. My 10X50 binoculars were beside me, but not for bird watching. I was observing the many southern belles sun bathing and playing in the Gulf of Mexico. In addition, the Perdido Sun Condo, a hundred yards east, employed a young male to teach and demo catamaran sailing to guests. While waiting for the water sports to begin I noticed a Martin hovering like, maybe a reincarnated helicopter pilot, about twenty feet above the condo and 100 or so feet out toward the Gulf. My attention was drawn to this show-off because I had never seen a Martin hover except around a nest. No other Martins were visible up or down the beach. Maybe three or four minutes elapsed with the Martin rapidly working his wings while hovering. Occasionaly the bird would relax for a moment drop down a few feet and then climb back up to his hover altitude of about 80 feet. I focused my binoculars on the Martin. The bird appeared to be looking south toward the Gulf. As I watched the bird, a huge beetle as big as my thumb zoomed into the scene from the Gulf. The bug was making lazy S turns while varying altitude about 12 to 18 inches. The bug was flying about at what I estimated as 25 miles per hour. He seemed to be on altitude and on heading for a mid-air collision with the Martin. As the bug streaked to within a few feet, the Martin broke hover and deftly plucked the beetle from the sky. 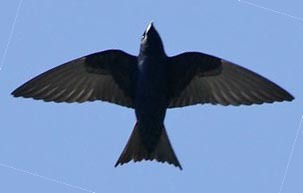 The Martin rapidly increased speed, turned right, and flew north over the condo with the big beetle locked in his small beak. 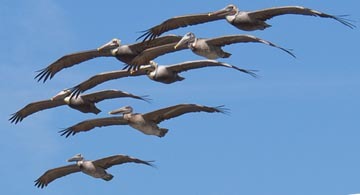 As I sat contemplating what I had just seen, eleven brown Pelicans in tight parade formation came from the west and glided silently by my balcony. The nearest giant bird seemed close enough for me to reach out and touch. The leader then pumped his wings slowly a couple of times and the following birds in formation pumped their wings in unison as they held the close formation positions. There are four challenging questions I took from my experience of bird watching that day: 1] How did Martin know Beetle’s actual time of arrival over Perdido Beach? 2]How did Martin know Beetle's precise point of crossing the Perdido Key beach line? 3] How did Martin know Beetle’s heading and course from South America? 4] How did Martin know Beetle’s altitude? 5] How did Martin obtain all of the absolutely essential information necessary to plan and execute the capture of that intercontinental Bug? I am still baffled and in awesome wonder by this seemingly impossible demonstration of one of God's wonderful creations. While pondering the mystery of the Martin I turned my binoculars to viewing Perdido Key sugar sand beach sights.